FRANCE – Bourg-Charente - Depuis le 23 juillet, les archéologues de l'Institut de recherches archéologiques préventives (INRAP) sondent deux hectares de terrain, en bordure de Charente. "C'est un site complexe qui correspond à des occupations humaines relevant du Paléolithique, de l'Antiquité et du Moyen-Age", résume Nelly Connet, responsable du chantier, "le site est remarquable par sa diversité, sa densité et son bon état de conservation". Des silex taillés ont été retrouvés dans la partie Paléolithique, permettant de dater les vestiges entre -80.000 et -25.000 ans. Un crâne de cheval ainsi qu'une vertèbre ont aussi été retrouvés. "On a rarement la chance d'observer autant de niveaux archéologiques qui se succèdent sans se télescoper", observe la responsable du chantier. La partie médiévale renferme un espace funéraire d'une quinzaine de tombes. Des restes de silos qui auraient pu contenir des grains ont été retrouvés. C'est la partie antique qui retient le plus l'attention des professionnels. Les restes de ce qui pourrait être le four d'un potier ont été retrouvés dans un deuxième ensemble. Une partie balnéaire a aussi été découverte. Le chantier, qui devait prendre fin en septembre, est prolongé jusqu'à la mi-novembre. ITALIE – Pompei - The head of an ancient Roman statue that could be of the mother of Emperor Nero has been recovered after being missing for decades, Italian police said on Thursday. The funerary piece was stolen between 25 and 30 years ago from Pompeii. The statue dates from between 100 B.C and 50 A.D when Rome was at its most powerful as the capital of a world empire and was found after an investigation into the art market by the military police of Piacenza in northern Italy. The Roman empress was one of the most prominent women of her time and the mother of Nero, an emperor famed for brutality. Some historical accounts say that Nero had his powerful mother killed. Police said the terracotta head had been hidden for years by a dentist in Parma, who had tried to sell it but couldn't because it was too conspicuous as a stolen work. The head was recovered after the 62-year-old tried to sell it through an antiques dealer from Piacenza aged 36, who accidentally alerted police as he tried to find a buyer. Both are now charged with receipt and possession of archaeological goods. 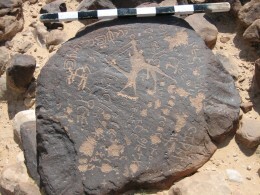 JORDANIE – Wadi Ramm - In her recent Archaeological Views column, Davida Eisenberg-Degen highlighted some of the reasons rock art has traditionally been neglected as a source of information about the past. Not only does this type of ancient “art” often appear to be little more than mere scratches on desert rocks, it can also be difficult to date the various carved figures, shapes, and scenes without a broad understanding of how drawing styles and motifs changed through time. But as Eisenberg-Degen notes, there are also some types of rock art that can be fairly accurately dated by the inscriptions that sign them, like the drawings of the so-called “Thamudic-speaking” tribes who roamed Palestine’s southern deserts about 2,000 years ago during the heyday of the Nabatean kingdom. ** And far from being “mere scratches,” many of these autographed drawings are detailed, complex narrative compositions that can justifiably be called “art.” For the better part of a decade, I have been studying these exceptional drawings to better understand the various messages their artists wanted to convey, both in art and in words. Thamudic is a catchall term used by scholars to describe the various ancient dialects that were written by the largely nomadic peoples of Arabia in antiquity. The dialect common to the desert regions of Palestine is known as Thamudic E as well as Hismaic, since it was particularly prevalent in the Hisma desert of southern Jordan (modern Wadi Ramm). There are tens of thousands of Hismaic inscriptions carved on desert boulders across southern Jordan, almost all of which are the simple, personal messages of local nomads and pastoralists who wrote short prayers to their gods, mused about lost loves and departed friends and autographed often exquisite drawings of camels and hunting. DANEMARK – Bornholm - A Viking era treasure of silver coins, which was buried around the year 854, has been discovered on Denmark's Bornholm island, in the Baltic sea, the island's museum said Thursday. The 152 Arab and Persian coins were forged in different parts of the Middle East, and represent the single-biggest collection of Arab coins dating from the 8th century, to be found in Denmark, the Bornholm Museum said. The first coins in the treasure were found by an amateur archaeologist in September, with the museum conducting excavations afterwards, the museum said to local media. The museum said it is unusual to find such early Arab coins in Scandinavia, adding it will now put the treasure on display. Archaeologists here said the treasure was hidden in a house in an early Viking-era settlement, and reflect a tendency at the time to safeguard such treasures by burying them under the floors of houses. Only some 20 coins are intact, while most of the rest are cut into pieces, because the Vikings used them as a unit of payment based on the weight of the silver. Most of the coins are very thin and worn out, and weigh three grams each on average. Although the total weight of the treasure is just 250 grams, that would have represented a fortune in Viking times, the museum said. The coins probably arrived in Bornholm as a consequence of the Vikings' trade with Eastern Europe, and reveal the island's former importance in the Baltic trade system, it added. The Vikings were Nordic warriors, merchants, raiders and explorers who roamed and settled in various parts of Europe and the North Atlantic between the 8th and 11th centuries.